As I was gathering my ingredients for the menudo that I was gonna cook for our lunch yesterday, I saw this Reno liver spread that was given to me by a Filipina friend here in base, few months back. It immediately popped up into my mind, what will be the taste of menudo if I add this to it. So being as curious as I am, I did put mixed it with my menudo menu. To my surprise, it was very good. 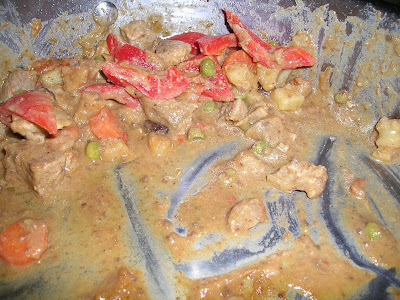 As you can see, this was the only left in the pan when I remember to capture a photo lol.. You might wanna try it guys.. It was darn good..
Goodnight for now folks, its 12:30 and I am so tired and sleepy. I just posted this one after I got done folding 3 baskets full of laundry... Whew! See you folks tomorrow! I was so touched by the sweetness of this little but beautiful girl from California. She sent me a very special gift for Mother's day, it's a personalized MD card! Do you recognize her? Yep, she is the daughter of my closefriends in the blogland, Dhemz and Greg. 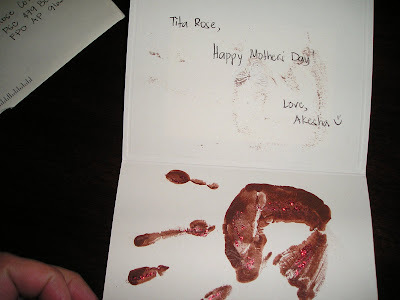 Thanks a lot Akesha my dear, you made Tita Rose very very happy. 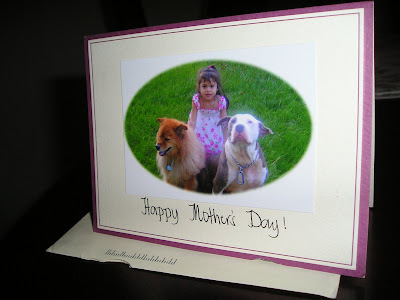 Tell Mommy thank you for helping you made this beautiful card! Take care and stay as sweet as you are! My husband's back was hurting yesterday so he called Rylie and told her to walk on his back. That is his therapeutic massage from our daughter. He was asking me to do it, but I was afraid that I might hurt him even more. My EJ helped too but all he wanted to do is bounce back and forth in Daddy's back lol.. Unfortunately I wasn't able to snap the scene.